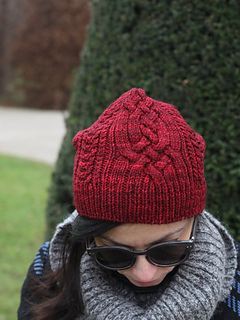 Raspberry Tart Hat is knit in the round from the bottom up with striking cable patterns. The crown shaping is integrated into the stitch pattern. Sample made with MadelineTosh Dk Twist (100% merino, 229 m/250 y per skein) in colourway Tart. 40 cm/16” circular needles and dpns are optional if you prefer the Magic Loop Method for working small circumferences in the round. Necessary skills: Working in the round with dpns or magic loop, working from chart, using a cable needle.